If you listen to art museum conversation, you'll hear all different attitudes echoing from the gallery walls. Some are awed by the skill it takes to create while others like the history and story shown in the art. Some treat modern art like a riddle to be decoded while others gawk as if they're at a freak show. We go to to impress a date or prove to ourselves that we're cultured. We go because we're seven and our parents dragged us here on a field trip. I've gone to art museums for all these reasons, but currently I go because art inspires ideas and gets me out of the house. I like pieces that relate to and expand my perceptions and appreciations. I find art to be reflective. It's often more dependant on the character of the person experiencing it than the art itself. The more open, intelligent, and knowledgeable someone is, the higher potential to enjoy or benefit from a museum. Next time I go, I think I'll bring blinders and earplugs so I can focus more on the art and less on the people. 1. 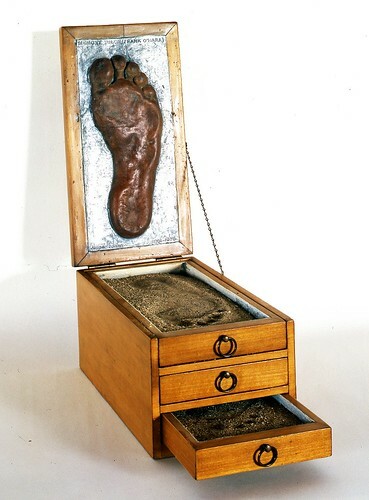 This piece by Bruce Nauman, "The True Artist Helps the World by Revealing Mystic Truth" addresses the crowd who is quick to dismiss modern art with a disapproving, "I could have done that." by stating the function of art in an artwork that simultaneously fulfills the function. the futile attempt of those left behind to organize and categorize the dead through second-hand impressions. I love the notion of saving and filing a footprint in sand with or without a mold to recreate it. It's also interesting as a memory piece. O'Hara is dead but his foot can go on influencing even if the box is shaken and the sand leveled. 3. This chessboard used to create the music in "Reunion" in 1968 was on special display. 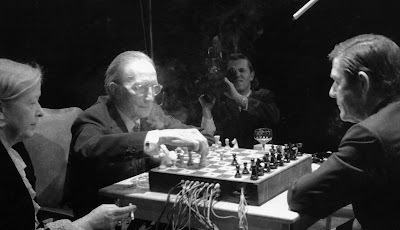 Sound was created based on the moves on the chessboard in a game between John Cage and Marcel Duchamp. Details here.